NEW YORK (CNNMoney) -- The all-electric Nissan Leaf was named the 2011 World Car of The Year at the New York Auto Show on Thursday. The Leaf, which went on sale in the United States in December and is also available in Japan and Europe, beat the BMW 5-Series and the Audi A8 for the top spot. "It is a great joy that the world's first, mass-marketed electric vehicle, the Nissan Leaf, has won the prestigious award," said Nissan Chairman and CEO Carlos Ghosn. Ghosn has been an outspoken booster of electric vehicles, predicting that they will account for 10% of the global auto market by 2020. Nissan plans to release it in other global markets in 2012. By then, almost every major automaker plans to have at least one plug-in car on the market. Toyota alone will have three, including the Rav4 EV SUV and the Prius plug-in. General Motors' Chevrolet Volt went on the market at almost the same time as the Leaf and has also won several prestigious awards, including North American Car of The Year at the Detroit Auto Show in January. 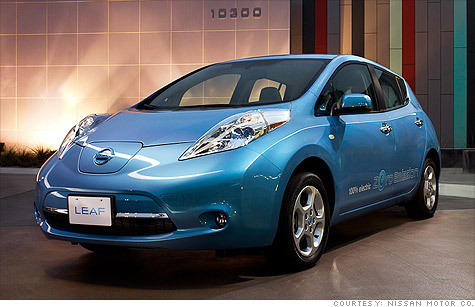 The Leaf is a zero-emission car, powered by a lithium-ion battery that can be recharged in about eight hours. It has a 100-mile range. Unlike the Leaf, the Chevy Volt has a battery range of only 40 miles. A gasoline engine kicks in after that. The Leaf was ranked No. 2, behind the natural gas-powered Honda Civic GX, in the American Council for an Energy-Efficient Economy's Greenest Car list last year. The Nissan has a sticker price of about $33,000, but after a federal tax credit of $7,500, the car costs about $25,000. The Leaf is considerably less expensive than the Volt, which costs around $40,000, or about $32,500 after the tax credit. The World Car of the Year awards announced at the New York Auto Show are chosen by a panel of automotive journalists from Asia, Europe and North America.